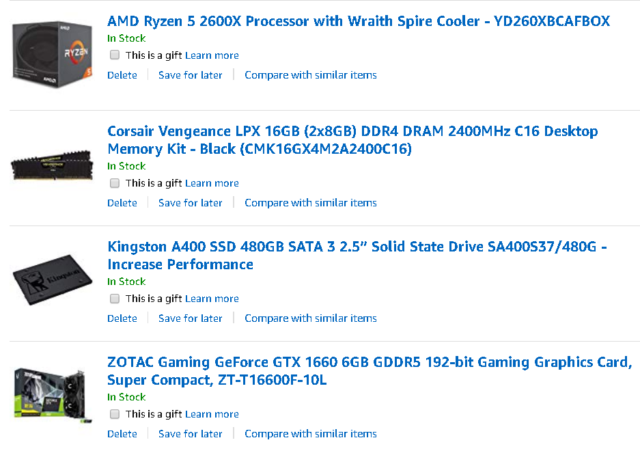 Im building my pc for running games, 3d programs for design, and other programs for generating 3d models from photographs. I thought to buy this components but im missing the motherboard and power supply. I'll add a hdd also and maybe expand the ram in a future. I wonder if u can help me with the missing components or maybe with some suggestion! pd: budget its 750 usd aprox for all of these plus case. Upgraded the memory to DDR4-3000. Ryzen likes fast memory, it sets the speed at which the CCX clusters communicate. Basically the CPU is made of two CPU modules. Not much reason to get the R5-2600X over the R5-2600, though, you could save about $15 that way. A simple BIOS change away from being as fast. Added an adequate case. I would like to see one more fan, but since this is relatively light, you can just move one of the fron fans to the rear. Or look at a slightly more expensive case to your tastes. Or plenty enough budget to add in your hard drive if you take the R5-2600. 2600X has a better stock cooler (Wraith Spire > Wraith Stealth) than the 2600. All you need to do so it auto-overclocks even better is to offset the CPU core voltage by a little (-50mV should work without thinking).